Bernat has a brand new yarn to their line up and let me just tell you – it’s wonderful! I’m always on the look out for the perfect spring and summer yarn to work with. I’ve spent the last two summers trying to keep everyone interested in their hobby during these warmer, busier months. A pretty significant number of you told me that the reason you put your hooks down this time of year is because it’s simply too hot to have a project laying on your lap. I heard you loud and clear so this season I’m keeping my eye on smaller projects with “cooler” yarns. I’ve hit the bullseye with the Dipped Tip Hat from Yarnspirations. Not only is this project small enough to fit in your hands while working it up, it uses a brand new yarn from Bernat called Beyond. Bernat Beyond is an acrylic nylon blend yarn that is fantastic to work with. It’s so silky smooth that you feel as though your working with a silk blend. It’s heavy in thickness (coming in at a super bulky #6) but not in actual weight. 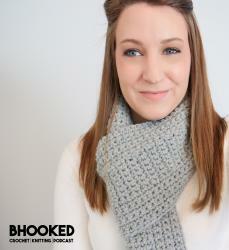 The resulting project is an ultra soft, chunky but somehow lightweight hat that is perfect for spring and fall weather. To make it even better, this project is perfect for the complete beginner when paired with my video tutorial. 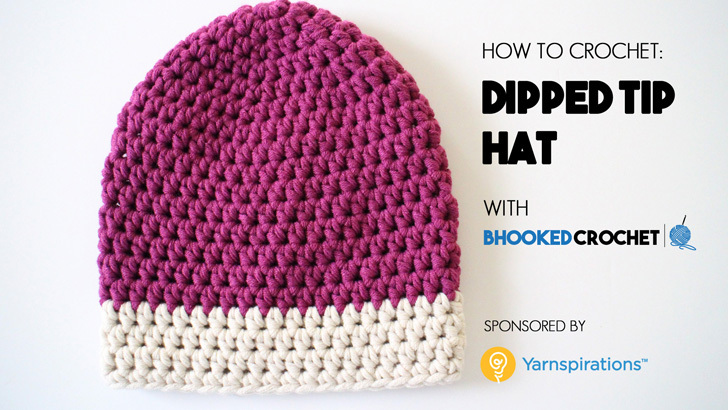 The Dipped Tip Hat from Yarnspirations is perfect for a beginner or a seasoned crocheter looking for a quick and simple project. The pattern is written for three sizes: child 4-6 yrs, child 8-10 yrs and adult. Choose two of your favorite colors to make your perfect Dipped Tip Hat. There are 24 shades to choose from! Once you download the free pattern and order your supplies, follow along with my video tutorial to walk you through the entire pattern. 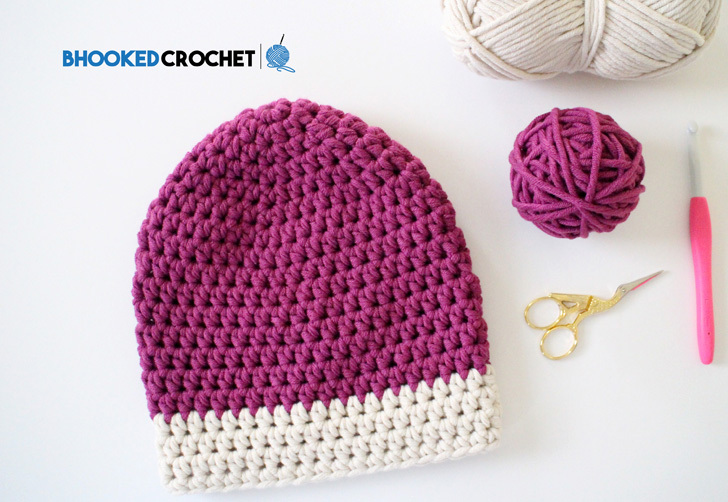 This tutorial is very beginner friendly, so if this is your first hat, you’ll love it – it covers EVERYTHING. You can access the video tutorial above in right hand and left handed versions. Bom dia! Não achei o link para o download. Você pode me ajudar?